Lynch syndrome is inherited through families in an autosomal dominant manner. This means an inherited mutation of the mismatch repair gene, coupled with a normal gene will produce children that have an estimated 50-50 chance of contracting Lynch syndrome. This basically leads the physician to determine whether or not to prescribe genetic counseling and/or genetic testing which, if positive, allows individuals diagnosed with Lynch syndrome to obtain annual screening tests to detect cancers early, when they are often treatable and not life threatening. Knowing family histories and sharing them with physicians not only helps protect us in avoiding certain hereditary illnesses and predispositions to chronic conditions but alerts us to possible complications which could occur during surgeries and conditions which can affect recovery. An added benefit is it allows us to learn of family traditions and stories of the trials and tribulations of our ancestors which can also greatly assist in achieving a strong recovery and survivorship. A good first step toward this process is to view the free, public resource available through the Surgeon General’s Family Health Initiative addressingdocumenting your family history. 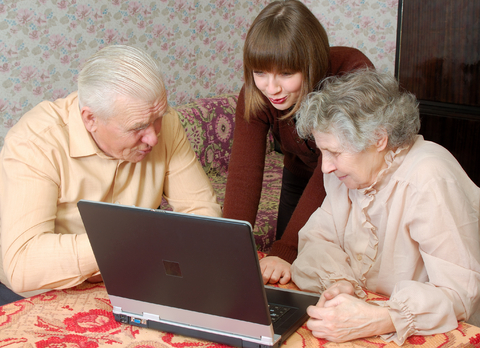 Their site has software available for use to document and print out the family history for family members and the health care provider. In addition, it has the capabilities for the family history to be downloaded into the medical file in your physician’s office. After reviewing it carefully, sit down with your parents and ask them their medical backgrounds, questions about their lives. Where were they born? What ethnicity were they and their ancestors? How and where did they grow up? Were they raised in the city or on a farm–in a small town or in a major metropolitan area? How did they get their water — from a well, or a municipality? What did they eat and how was it prepared? What was their life like? Did they work in factories or spray crops? When and where were they born? Were they ever ill or hospitalized? Did they contract any cancers? At what age? If so, where was the cancer located? Where were they treated? These questions are extremely important as environmental factors have every bit as much of an effect on cancers as hereditary factors and can provide clues into what familial or inherited cancer condition one may have. Everything is interrelated when it comes to cancer. Therefore, list every occupation, every situation, everything those ancestors did and when, where and at what age it occurred. Ask about their parents, grandparents, brothers and sisters, nieces and nephews and pose the same questions you asked about your parents’ past and lifestyles. Every answer they provide will render little clues as to the information you will need to protect yourself and your family. In many families, adults and other family members have often kept health matters private and may at first appear uncomfortable about answering these questions. It is important to ask the right questions and to prompt them and job their memories as to where there was removal of colon polyps, skin melanomas, abdominal surgeries, brain disorders and hysterectomies. Be certain to document each and every one. When documenting the family history, don’t forget to ask about hysterectomies. Today, one of three women have had a hysterectomy. This information can significantly provide clues or information to create a direct relationship as endometrial cancer may be equally as prolific in Lynch syndrome as colorectal cancer. Its also not unusual for family members to have little or no knowledge of how grandparents, aunts and uncles or cousins died so simply ask them when and where…then go to the local library or newspaper office and research the obituary or pull the death certificate from the state or country department of vital records. After you obtain the family history, draw your pedigree. When preparing a family history, its a good practice to not limit one’s self strictly to Lynch syndrome, but to document every possible condition parents, siblings, children, grandparents, aunts, uncles, nieces, nephews, cousins and ancestors could have had. This process is often eye opening and can provide a totally new perspective in respect to other potential unknown health conditions. While performing research upon our ancestors and related family members, it only helps us to learn not only how they died but what our ancestors endured in life. This can prove invaluable toward our own sense of survival. The characters of our ancestors can serve as clues as to how they survived unthinkable conditions. Those clues may dramatically help us weave our way through the survival process. In reflecting upon how they lived and managed despite incredible adversity, we can draw from their strength. Once the family history is provided to the doctor, he/she will assess it and by the use of online tools or by expertise, will determine the level of risk for inherited conditions and whether or not to refer you to a genetic counselor or grant a direct referral for genetic testing. The taking of a family medical history is considered a “standard of care,” taught to all physicians at all medical schools and is considered “good medicine.” However in today’s quickly evolving technical world, there are an overwhelming number of things for physicians to know. Therefore, it is reasonable to assume your physician, gynecologist, urologist, dermatologist, obstetrician or pediatrician may not be aware of Lynch syndrome. We may have to provide our care providers with guidelines and resources so they may become familiar with it. 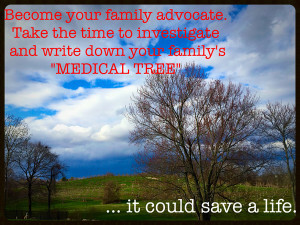 A family medical history will assist health providers in not only determining risk and patterns that may be relevant to one’s own health but also provide them with information to recommend prevention tools to reduce the risk of disease, decide what diagnostic tests to prescribe, assess whether or not genetic tests are necessary, diagnose a condition that may not otherwise have been considered, determine whether or not other members of your family are at risk for disease and other measures that could be life saving. The family medical history won’t predict your future health but will allow you to know if you are at high risk for disease, life threatening or chronic conditions. The past provides clues to our futures so we and our families may remain happy, healthy and intact. 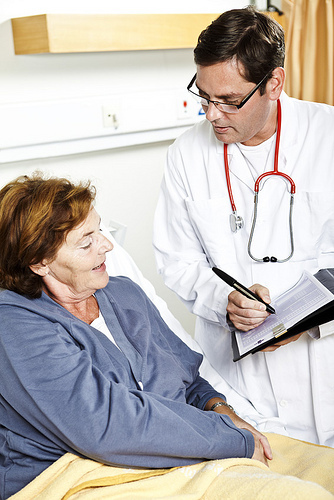 Researching your family medical history is not only good sense and a loving thing to do, not only as parents, but as a responsibility of a patient to provide to the care provider.